King Crimson have always been one of the most creative and innovative bands out there. When you expect them to jab they dodge and when you think they are going to dodge you’d better duck. These guys (thanks to head Crimsoid Robert Fripp) seem to love to do the unexpected and will always keep you on your toes. 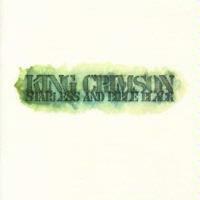 Well, Starless and Bible Black is one of the albums many fans consider “essential.” It showcases much of what makes Crimson so great. On the one hand we get pieces of music that feel accessible and rather mainstream, but still have so much going on within when you dig deep enough. We also get several instrumental improvisational excursions that really stretch out. Within the course of this one album we see fine examples of both jabbing and dodging. It’s a disc that has held up very well over the years and still feels fresh every time you pull it out. A fast paced, jazzy jam opens this up. It twists and turns and has a rather “cheery” feeling to it. They drop it back to a stripped down and rather bluesy texture for the verse and then power back out for the chorus. They work in an off time on the verse. Then they take us out into a soaring sort of jam for the bridge. It’s dropped way back down to something that might have felt at home as a quiet moment on a Beatles album. Then they bring us into a more intense take on the song’s opening passage. This gives way to a more powered up (and weirder) take on the verse section. It gets pretty ferocious before it ends. The first minute plus of this is in a dramatic balladic approach with washes of symphonic textures bringing lush layers to the table. They fire out in a cool rhythmic jam after that and then this gives way to a screaming jam. It’s loud and just plain tasty. They take us through some variations as they carry on and this is really one of my all time favorite KC songs. It turns to an almost funky sort of jam later that feels like it was quite “radio friendly.” Each time you think they might drop back to the mellower balladic section they take us somewhere else. The early moments here are rife with harmonics and sedate textures. The bass eventually brings in a funky riff and they start to build things up in a rather blues meets prog fashion. It’s amazing how catchy and “mainstream” this jam feels considering all the weird little things going on. Bruford throws little pieces of percussion here and there. Fripp’s guitar screams in little lines all over the outside. It moves through weird turns and changes and takes us down into ambient weirdness to end. With all of that it’s still a highlight of the disc. A noisy build up shows hints of lovely melody. It works through and drops back for a balladic verse. Then harmonics lead us out into the next wave of sound. It is essentially as a more powerful take on the verse and we get more of Wetton’s vocals. This is both beautiful and evocative. The track just keeps building up gradually from there. After building way up, but never really exploding outward, they drop it back down for another verse in the vein of the first one. Then a burst of sound brings us back into the more powered up vision. This doesn’t last long, though, Instead they drop it back down even further for another vocal section that ends it (after a bit of a symphonic flourish). The first couple minutes of this are so atmospheric that unless you turn your volume up pretty far it will seem like silence. When it does rise to the level of being easily heard it is still pastoral and quite pretty. There is a definite symphonic air to this. It never really moves far from this origin, but rather plays with gentle world music textures and elements. This instrumental might not be a highlight of the disc, but it does serve as a gentle respite. Bill Bruford’s percussion starts things here. Other elements and textures are added as this builds in an intense, but organic way. This is somewhat free form, yet it feels structured. Fripp’s guitar soars all over this without intruding. It has an accessible feeling to it and yet challenges the senses with rather dissonant features. There are no vocals until about the last minute. Even then they don’t over power, but do feature fairly prominently. The group continue experimenting and reworking this right til the end, although the bass guitar does climb to a high point in the mix towards the close. Here we get another rather freeform jam. The first large chunk of this instrumental is mellow and quite low in the mix. They power out organically and eventually this is built into a fiery sort of jam. Everyone gets their chance to shine here yet the real charm is the whole of all the parts – not any one star. It drops way back down again around the six minute mark (at over nine minutes in length this is the second longest cut on show here). After building up for a short time and then dropping back down even further they seem ready to bring it back up into some serious rocking territory. Instead it drops away again and then a fiery new jam springs up. This doesn’t stay around long, though as they bring it back down to atmospheric territory once more to end. At over eleven minutes in length this is the longest track on show here. The first half of this instrumental is in the form of a free form sort of motif that alternates between ambient, stripped down arrangements and more full on takes. Later in the track, though, they scream out into a killer musical motif that feels more composed. It also is quite akin to the music on the Red album. This is one of the more powerful passages on the whole album and makes for a great conclusion.